TWEEDBANK LAD CHARLIE BASHFORD IS WELL PLEASED WHEN HE IS PICKED. It’s youngsters to the fore as Tweedbank gets on track for its fair week – and the arrival of the train is expected to give the fair a major boost next year. This year’s Tweedbank Lad and Lass are Charlie Bashford and Carmen Paterson-Benton who are both primary seven pupils at the local primary school. TWEEDBANK LAD CHARLIE BASHFORD with LASS CARMEN PATERSON-BENTON. Backing them will be fellow pupils First and Second Lad’s Attendants Murray Anderson and Paul Boggs and First and Second Lass’ Attendants Abbi McCormack and Kyla La Grange. Tweedbank Fair takes place between May 23 and May 30 with a variety of events. The principals will be invested at a ceremony attended by the Braw Lad and Braw Lass from Galashiels on May 26. Fair chairman Rob Goudie commented: “There is a full programme for the whole week and hopefully it will be as well supported as it was last year. 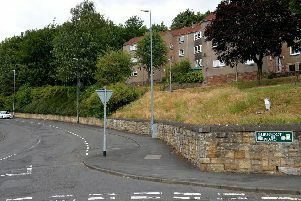 But some people are stepping down from the organising committee because they have had their spell, and an appeal has been made to Tweedbank residents to come forward and offer their services.